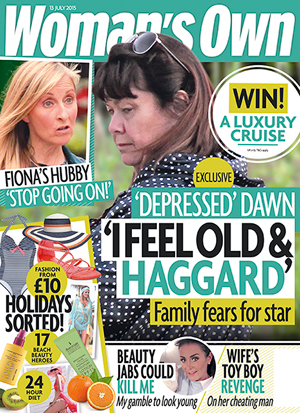 This week, see why Fiona Phillips is sick of her husband going on at her and find out why Dawn’s feeling depressed. Plus we reveal who Carole McGiffin has launched a bitter attack against… Things are getting nasty! Amanda Holden’s opted for a brand new look.. But we can’t say we approve! We’ve got all the goss and the latest pics inside. Plus, there’s gripping real life, including the woman who got her revenge with a new toyboy after she found out her ex was cheating and the rise of the serial surrogates, the women making money out of renting out their wombs. And don’t forget our fab fashion and beauty features, include the summer wardrobe must haves under £30 and the travel minis you need for your hols.